It’s been 6 months, 24 days and 8 hours since my last log on. It’s been a tough road. You know how it is. I’d be out at a party amongst friends, and WoW would come up. They’d tell me how much they missed raiding with me, or would offer to gear me up in the newest epic loot. I’d start sweating, stammering about how I was clean now, I’d moved on with my life. They didn’t listen though. One even pulled me aside and pressed something into my hand. When I looked down, it was a free 10 day trial pass. “Just to show you how much you’ve missed it!” he said. I had to run out of there and unplug my router at home, just to make sure I didn’t backslide. But every road to recovery had a few potholes right? I’ve been good though, I’m eating better, getting out more…I even lost my WoW-belly. I’m worried though. I think I might be headed for a relapse. 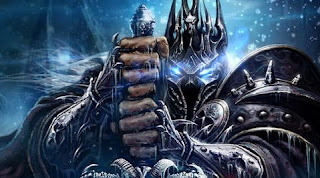 You see, this little thing called Wrath of the Lich King came out last week. I knew this was coming, and I lied to myself and said I could handle it. But the truth is, I’ve got the Itch again. I started feeling it when Blizzard revealed all their Death Knight information and it only got worse with every content patch since. Zombie invasions…massive class changes…motorcycles? Damn you Blizzard and your enabling ways. The Itch only grew when they showed what would be offered in the Collectors Edition. Normally I can resist CE’s, but Blizzard always offers the premium stuff, not some chopped up Fable 2 CE. The worst of it came when my girlfriend decided to dust off her Blood Elf and finally get to 70 in preparation for Lich King. Another enabler in my midst! I don’t know how much longer I can hold out. The Itch grows and grows every day. I’ve called my sponsors but they’re all raiding and not answering the phone. I’ve tried calling Visa and telling them to cancel my credit card so I can’t sign up again, but they’re busy levelling their Death Knights. Some day soon my friends...I’ll slip. When people ask what happened to that happy young man they used to see out in the real world, tell them I fell back into Azeroth. Tell them that the Itch needed to be scratched. Drew - I'm not a WoW player, I've resisted the call for years, but NextGen Player needs a corespondent to cover all things WoW... and as Editor I'm nominating you to be the representative... Go find Nymity (our Guest Writer), your GF's Elf and Raid away - save Azeroth you can do it, I know you can. Come back, Drew. We miss you. My shaman is now lvl 72 and loving it, my husband has his deathknight at lvl 71 and coming on strong. If you and your girlfriend join us we could complete some serious content =) Mucho loots for all! Haha, you guys shouldn't encourage me! I think I will be signing up again as soon as exams are over. Haha, my gf wasn't interested in this game at all until she saw the baby polar bear! She thought it was soooo cute that she decided to start playing LOL.